Hi, I am interested in your 1970 Chevrolet Chevelle (stock #1288-NSH) listed on Autotrader for $39,995. I'd like to get more information about this vehicle and confirm its availability. How do you make one of the most popular muscle cars ever built stand out in a crowd? Well, the way they did it on this car is by choosing a killer color combination, then make sure the paint job makes you say wow and the interior makes you say holy cow ! Check it out. There are lots of Black cars on the road, but very few of them look this good. Black paint is very unforgiving. It shows flaws that even good paint professionals didnt think were there until they start buffing it out. It is obvious that a true professional took a lot of time and effort on this car to get all the panels perfectly prepped so that when the job was done the finish would be like glass and the light would reflect off of it in long smooth lines. Add a pair of White SS racing stripes running up the cowl induction hood and over the trunk with the same care and quality, and you are done with the paint. 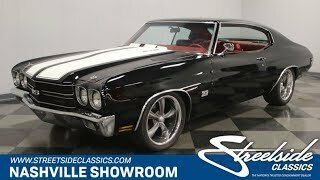 Then make sure the chrome bumpers both front and rear shine brightly, put SS badges on the nose of the blacked-out grill as well as on the front fenders and again at the back, and there will be little doubt that this is one special Chevelle. When you open the door, you will find an absolutely stunning Red interior. Like the body and paint, it has also received the care, attention and time of skilled professionals in order to separate it from the crowd. The door panel looks sharp with thin chrome piping edging a vertically pleated center panel. The steering wheel is a real attention grabber wrapped in Red leather. Its mounted on a tilt column and a 4-spoke hub with a bowtie center button, and a shift knob for the 4-speed manual transmission falls easily to hand. The black dash panel has been upgraded with Auto Meter Sport Comp II gauges with the speedo and tach directly in front of the driver while the oil pressure, water temp and volt meters are off to the right. Just below them there is a Pioneer head unit that is AM/FM/CD and iPod compatible for your listening pleasure. The seats have been nicely reupholstered and the red headliner and carpeting tie the look of this interior together nicely. Pull the pins to lift that cowl induction hood on this car and you will find a potent 383 stroker motor nestled down in a neat and clean engine bay. A chrome Edelbrock air filter assembly feeds lots of clean fresh air to a Holley 4-barrel carburetor and an Edelbrock intake manifold. Chevy Orange valve covers have the bowtie and Chevrolet lettering polished up and looking good. Pulleys and accessory mounts are cut from aluminum billet and an aluminum radiator with an electric fan assures that things will stay running cool, even under pressure. Long tube headers wind their way out the bottom and back through dual Flowmaster mufflers. This motor sounds fantastic! Power front disc brakes insure that you can haul this ride back down from speed if you decide to let the horses run and the rubber meets the road through 285/40ZR18s in the back and 245/40ZR18s in the front mounted on some awesome looking Boss alloy wheels. A killer color combination and first-class workmanship make this car a real stand out. Its just looking for a new owner who will keep it polished up and take it out to show it off every now and again. Would that be you? Come on down and check it out.